There are many reasons why I enjoy using Twitter. One of the biggest reasons is this: the joy that results from making a new connection that seemingly happens just because. Sure, there’s usually an attributable cause as to why a relationship gets started on Twitter — perhaps you participate in a similar #chat. But you don’t necessarily need to hound them down for months or request an “introduction” through 4 other parties. For whatever reason, you connect… and from that point on, a fulfilling and rewarding relationship results. When using Twitter for business, you cannot always allow relationships to “just happen”. There may be times that you need to find people based location, title, or role. If you have that need, here is a tool that may provide some help — FollowerWonk. 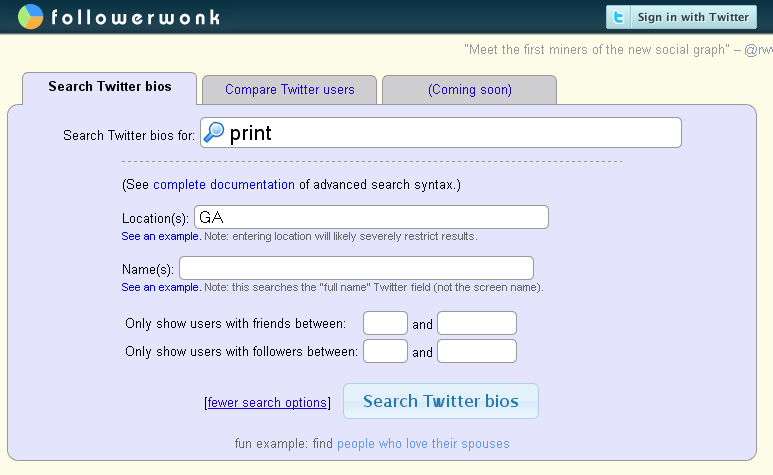 Basically, FollowerWonk allows you to search for people on Twitter based on terms that may appear in their Bio. Also, you can narrow down the results to a specific location. Of course, the results are not always perfect. You will find people who haven’t updated Twitter in 18 months. FollowerWonk does provide you with the ability to filter your results based on the person’s number of followers, which may help to reduce some of that clutter. FollowerWonk has helped me recently to promote events around the country that our company is participating in. Sure, I use other channels (print, email, mobile) too. 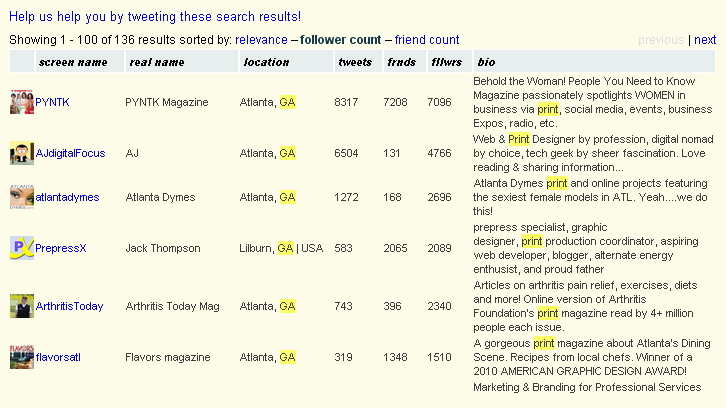 But it has proven to be quite a valuable resource for finding people who may want to engage via social media. Of course, I’m not encouraging you to find a list of people and then send out a blast tweet! Twitter best practices still apply, y’all. But in regards to applying marketing fundamentals and ensuring that you are targeting the right audience, a tool such as FollowerWonk can help. Such a cornucopia of information! How lucky was I to get to meet you Mr. Jason? If ever I can help you out with anything please don’t hesitate to ask me. I love this tool! Cheri…. you are far too kind! Honestly, you are the one that helps me out on a daily basis! Thank you for all of the informative and helpful content that you are share via your profiles. But I’m quite happy too that you’re enjoying FollowerWonk so far.